This isn't a new topic to discuss about but often it's not something one would share unless being asked about it. So after experiencing another round of traumatizing events in Japan, this is a topic i must share with you guys followed by my upcoming post "death in Japan procedure". When stuff like these happens the first thing we do is to obviously turn to google for answers, time and time again google has somewhat failed with with scattered bits and pieces of information that isn't very useful for a panicking person, that's why i've decided to pen it down here from guiding you guys from the start to the end on how to get back on your feet. But first calm yourselves down, have some hot chocolate/ tea/ coffee and wait till the next morning when offices starts operating again, running around like a headless chicken in the middle of the night isn't going to help the situation because you are gonna need all the strength you can get walking to and fro trying to settle this sh*t out. Still kinda annoyed with myself on how careless i was. Kns. It happened when i was rushing to reach my hotel in Kichijoji as earlier there was a delay due to unfavorable weather thus the plane could not land in Haneda according to it's initial schedule. Due to the 30 mins delay flying in circles, by the time we landed and got passed the immigration i had already missed my last bus to Kichijoji (there's a direct bus from the airport to Kichijoji station), but was told that i could still take the train instead if i hurry so i did, and that was the worst decision ever. In my gut i felt that i should wait overnight at the airport and take the earliest bus instead but NOOOO! Silly stubborn me trying to be hero and control of the situation when it's better to just let it be and i got myself into another COSTLY mess. Kns to the max. Doesn't make things any easier when people start sending you either obsolete info on this matter or tell you things like "you might have to burn your current return ticket".Seriously not cool people, if you can't be helpful to your friends please don't say anything at all because you are just making the situation worst by saying those unhelpful things. It's like every time i go to Japan there's something bound to happen, bad or good i'll let you guys be the judge of it la. 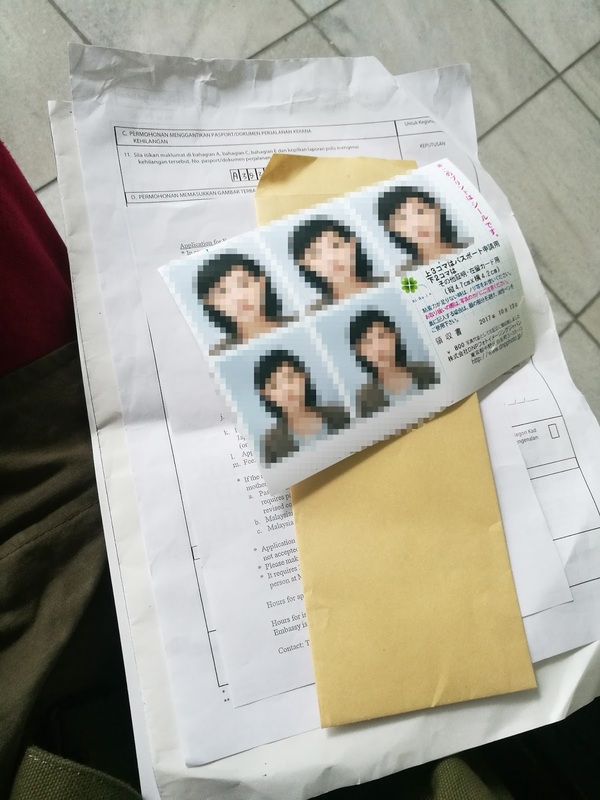 But on the brighter side at least through these experiences i can prepare myself better for future travels and also help others (if you are reading this post for reference) who are in the same unfortunate situation as well. Okay, so make sure to bookmark this page before you travel to Japan okay! It's gonna take somewhat a half to a whole day to get this all sorted out, so make sure to cancel whatever plans you have beforehand. Always make sure to take a photo of your important documents (I.C, Passport, Flight ticket) and save it either in your phone, email or storage cloud because these may come in handy. Don't panic, slowly start retracing back your steps on where you last saw your passport, it can be at the airport (last taken out for the immigration checks) , train station or at the last cafe you were at. Narrow down your whereabouts and start searching from there. If it's late at night passed 12am then best to head back to your hotel/ dorm to freshen up and rest, try not to wait at the deserted train station because it can be dangerous especially if you are a girl or unless you are crazy like me to stay back of course (my 2nd time already lel). If you think you lost it at the train station, go up to their lost and found counter within 24-48 hours to ask about it, they are usually open from 8.30am onwards. Or if there is a nearby police station around the area, chances are some good Samaritan might have dropped it off there. If there is no signs of it from these 2 place then most likely someone stole it already. If you can speak Japanese this step would be 100% times easier, if you do not have any basic knowledge of the language it's good to have a local friend to help you out or call your insurance 24 hours care hotline to let them know your situation and they'll assist you from there. Don't worry, i will elaborate more on the Japan travel insurance below this post, it has nothing to do with your health insurance back in your home country as that isn't valid for cases like these unless you suffer some kind of illness during travel la *touchwood*. The police will ask come questions like what are the lost items, kindly describe as accurate as possible, value of it, time and place where it's last seen. Make sure to get a copy of your report as you'll need it for the Malaysian embassy. It should look something like this, hope this visual would give you an idea of what you should have before you walk out of the station. 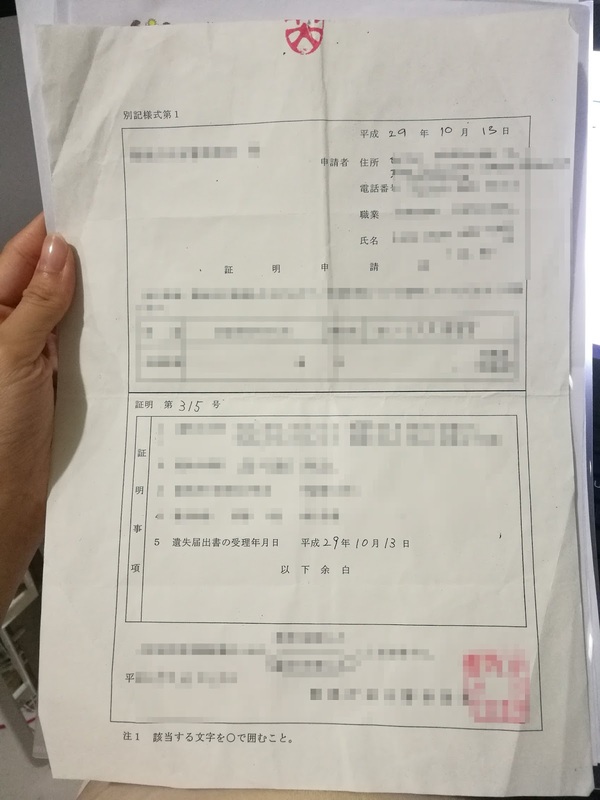 Even if you can't speak the language, the picture would speak for itself and do take note that not every police station is familiar with this kind of procedure because when i made the 1st report at Shinagawa police station, they did not pass me any paper as proof i made the report. I assume everything was done accordingly until upon submission at the embassy my application was rejected because i was lacking the ACTUAL report copy which is needed to be issued out by the police. but you get the rough idea of how the paper looks like. Always store cash in various bags/ pocket/ luggage, distribute the portion rather than putting it all in one pouch which might end up missing with your ID & Cards. Being stranded in a foreign country cashless is one of the worst thing that can ever happen to a person next to losing your passport of course. Or else you'll end up like me making silly multiple trips back and forth which can be quite frustrating and tiring AF because everything is like minimal 1km away from each other. On average days 1km walk is barely anything but when you are not in the mood for strolls, walking seems like a huge chore. I went to Shibuya police station to get my 2nd report done, and at the train station itself (near hachiko) there are machines that takes ID/ passport photos for only 800‎¥‎ but be careful with the cropping or else you'll end up needing to take another round like i did which wasted another rm25 *sobs*! It prints out on the spot so you'll need to wait about 3-5 mins for it. Malaysian embassy in Japan is also located in Shibuya, Tokyo so it made more sense to get everything done with the area before heading over to submit. If you can't get your files printed (from your phone) you can request for help at the embassy to help you print it out, just email them the photo files. BUT highly advisable to get it printed from your hotel's printing machine or nearest cybercafe. You know i noticed that whenever something bad happens to me in Japan it always exactly before the weekend and the embassy is closed, just imagine my flight is on the following Monday and i had to make sure that my temporary passport was obtained by then or else my flight ticket would have been burnt (the additional costs!!). But do take note that Malaysia Embassy in Tokyo opens from 9am-12pm ONLY FOR DOCUMENT SUBMISSIONS (so best to catch them by then) and if everything goes well (usually it does) you can come back the next day at 2.30pm-4pm FOR COLLECTION ONLY. It takes an average of 1 working day to process your application and release a temporary passport for your return home. This is how your temporary passport looks like, it's brown in color and it's only valid for 1 FLIGHT BACK (can't be used multiple times). 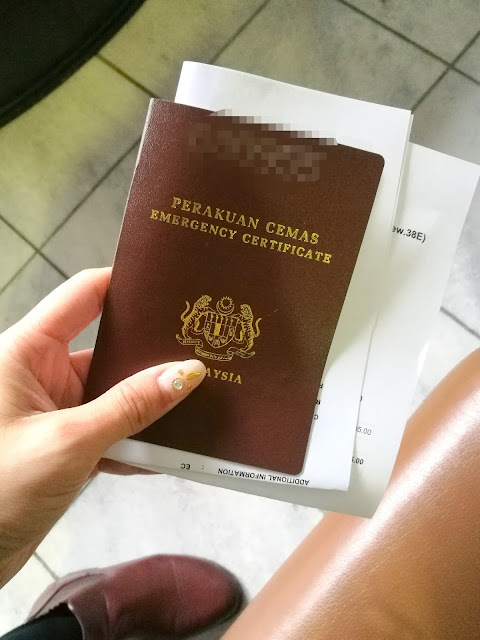 This passport is to be handed back to our local immigration office but i'll share more details of the procedures back in Malaysia in my next blog post once my new passport is collected next week. 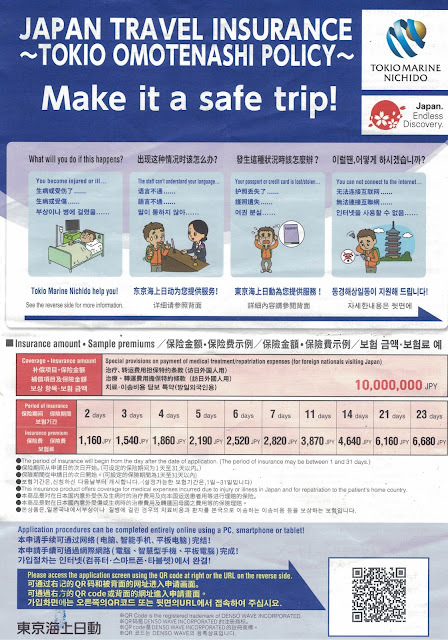 You'll be stopped at Japan's airport immigration for abit for questioning so make sure to arrive early if not you'll end up missing your flight as well if they detain you longer than 30 mins (usually 10 mins la). I know Malaysians like to do things last minute but please do arrive at the airport like 5 hours early and kill time there rather than rush and end up getting into more trouble. So hope this blog entry is useful to all of you out there in case yourself, a family member or a friend encounter such unfortunate circumstances (obviously we hope it doesn't happen la). So be careful and mindful with your belongings at all times, people are quick to grab stuff especially in areas full of tourists like major train stations, malls or the airport. Really thank you so much for cycling all the way just to stay with me at the train station, next meal is on me when i come over to Ehime! 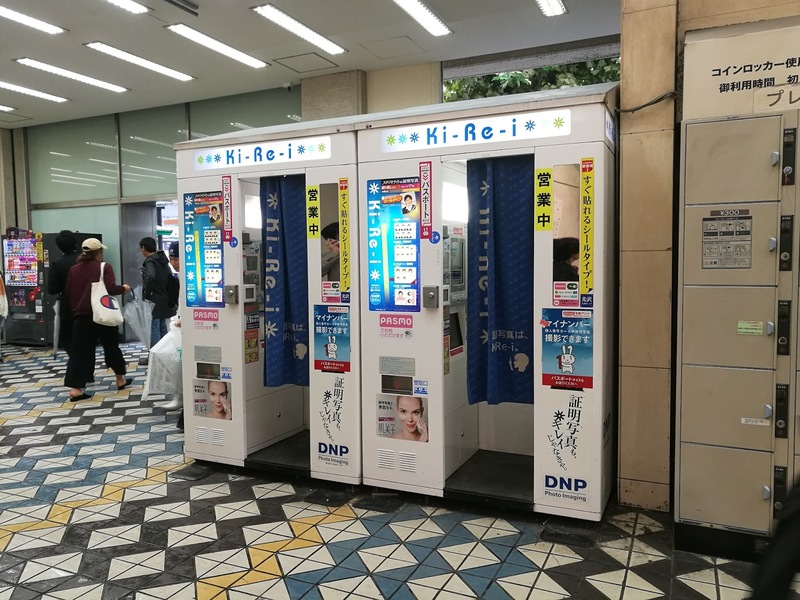 Not sponsored to promote them but i found out about this through my friend who's an Insurance agent in Japan after the passing of my daughter in Kyoto earlier this year. With the rates and support provided by the policy, it's actually very pretty worth it. 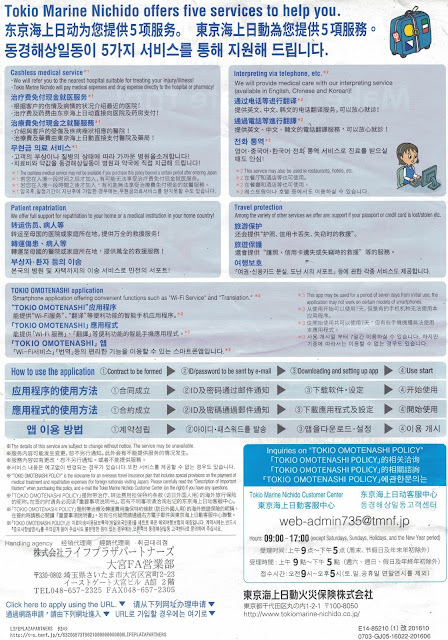 If you would like assistance for cases like missing passport, make sure to call Tokio Marine while you are there because the minute you leave the country your insurance policy becomes invalid. 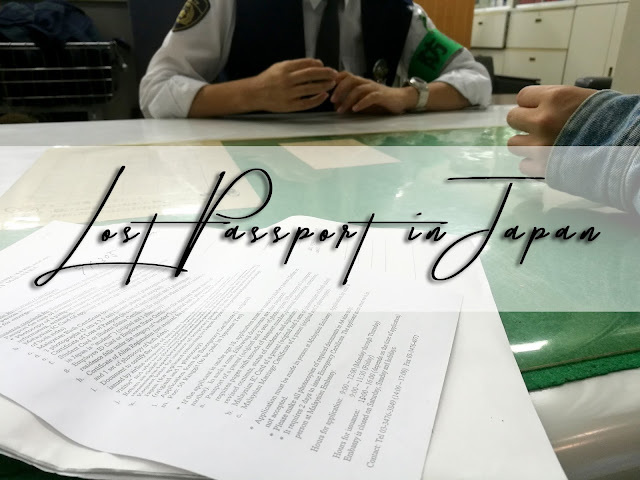 Thanks for providing great guidance for all the expatriates who lives in Japan and are worried because they have lost their passports.Its has been no doubt a great help.